Hi! Interesting post on the Checkpoint. I was tooling around the Internet and came across this picture of my postcard (well, not mine – just has my face on it) on your blog. 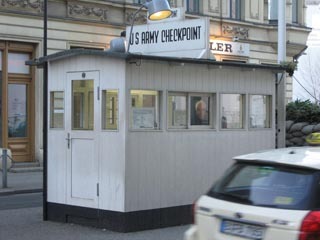 Military checkpoints are often given names, but also alphabetic designators like A (Alpha), B (Bravo), and C (Charlie). 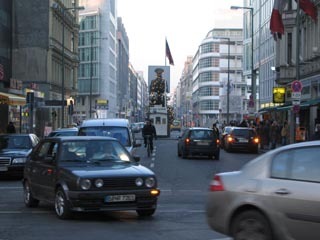 In East Germany, we had three; one in Helmstedt (the old border to the west), one on the southwestern edge of the city, and one between east and west Berlin. The Soviets were required to allow us access at all three. 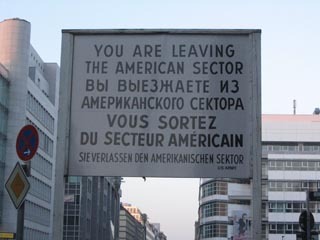 I was in Berlin before the wall fell and stayed with the U.S. Army in Berlin until 1994. I am still in and on my way from VA Beach to Seattle for my last assignment before I get out. I found out my face was used for the memorial in 1999 and think it makes great coffee table conversation. I also have relatives (my wife is from Berlin) still in the city andn get back frequently. I hope you enjoyed your stay in Europe. Wow! 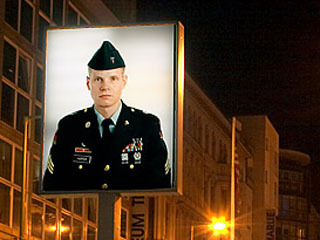 The Checkpoint Charlie guy posted on your blog! I was just up there during th World Cup. Sweet! I was a sophomore in college when the Wall came down. My dad was in the Army and stationed in Germany at the time, but I was back in the States for school. With my dad’s job, we’d been in Germany before, and I’d been to Berlin twice before, when I was in grade school. It coming down was something I thought I’d never see. The following summer, when I went home, my family went to Berlin again. 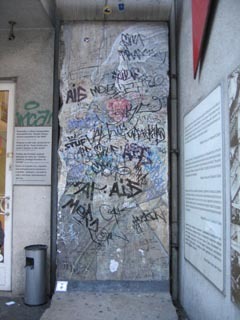 I did a post a while back in which I posted some photos from those trips to Berlin. I continue to get hits from people doing Google image search (not sure the the search phrase) taking them to some of those images. 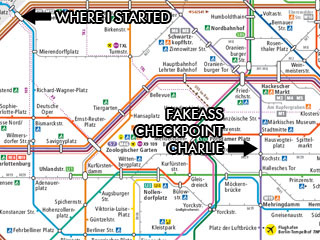 Tonight, I decided to do a google search on “Checkpoint Charlie”. One of those images – the section of the Wall outside that shop or museum (I don’t remember which) is what brought me here. I wanted to confirm it is the same section of wall that was there when I last visited in May 1990, and it is. Only it is now defaced with graffiti. That makes me incredibly sad – it has destroyed such a beautiful and moving image.